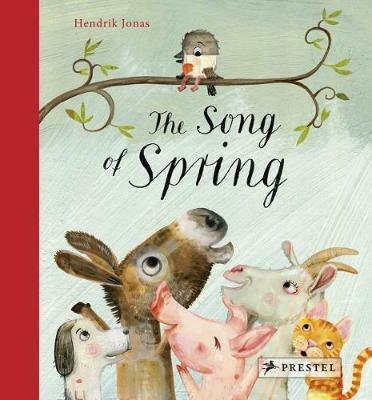 So begins the picture book The Song of Spring, written and illustrated by Hendrik Jonas- with a gentle nod to the increased activity of bird songs in the spring. But for one little bird, things don’t get off on the best note. Literally. For this one little bird seems to have forgotten his special spring song. But he truly longs for a partner, so he bursts out with the first sound that comes to his head. As it would turn out, “woof” does not bring along another bird friend, but a dog instead. The bird isn’t satisfied, so with the dog’s encouragement, he gives it another go. Unsurprisingly, his cry of “oink” doesn’t work either. And so it goes with one sound to the next, and while the bird accumulates a cheering crowd of animal pals, they’re not exactly who he was hoping to attract. Just as the bird is about to give up since he still cannot recall his special song, a loud, strange sound is heard by all. What could it be? Perhaps the little bird won’t be alone after all? This cute little picture book is sized perfectly for little hands and delivers a sweet and simple story to celebrate the beginning of spring and the joy of friendship. The illustrations are more realistic than many featuring real-life animals, but the soft, muted colors give them a sense of whimsy. Read this book with a little one in your life and then head outside to listen to the birds singing their own spring songs!